If your divorce is not final by the end of the year, you have options as to how to file your tax return. Filing jointly may be the most advantageous financially. However, you could be held liable for any mistakes or falsehoods in a joint return that you sign. If, for example, you’re concerned about the completeness of your spouse’s income and assets on his or her tax return, then you may wish to file as married but separate. If your divorce is not final by the end of the year, then you may not file as single. Should your spouse wish to file separately, you cannot force him or her to file jointly. All tax liabilities AND refunds must be divided equally, regardless of which spouse contributed the income that caused the liability or refund. While assets may appear to be comparable in value on their face, they may carry different tax burdens. Make sure to calculate the anticipated taxes to be paid on given assets before agreeing to a particular division of assets. 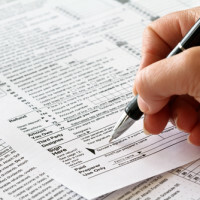 For example, while a house and a retirement account may have similar face values, these assets are likely to come with very disparate tax burdens. Even if you are the party to move out of the house, you can still agree in writing with your spouse that the home will be considered your primary residence for tax purposes. If there are unpaid property taxes associated with the marital home and you are the spouse to move, you can still be held liable for property taxes accrued up until the day you move out. Alimony is, by default, taxable income for the recipient. However, the parties can agree in writing that it is non-taxable. Spouses may wish to do so where, for example, the payor does not need to or cannot claim the deduction from paying the alimony. If you have had to incur expenses to collect alimony, and the payor spouse is not paying your attorneys’ fees, you may deduct these expenses. Unlike spousal support, child support is not taxable income or a deductible payment. Any income tax refund owed to you may be garnished if you are in arrears on child support payments. If you are paying spousal support (alimony), you may deduct these payments on your tax return, even if you do not itemize your deductions. You may not deduct payment of child support. There are a variety of payments which can be considered “spousal support,” including cash paid toward the recipient’s rent, taxes, mortgage, or medical expenses, and the recipient’s attorneys’ fees. As a rule, the parent with primary physical custody is the only parent who can claim head-of-household status on their return. If custody is shared equally, neither parent can claim head-of-household status. The parents could alternate years of holding 51% custody over a single child, or each hold 51% over one child if there are two or more. A non-custodial parent can claim the children as dependents, but will be subject to higher child support payments. The custodial parent must file form 8332 to assign the dependent to the non-custodial parent. This form supersedes the divorce agreement for the IRS’ purposes.